Holden Manz has planned a special Valentine�s package for two that includes a picnic lunch, dinner at the Franschhoek Kitchen and a stay at the grand Holden Manz Country House. Couples attending the Valentine�s dinner at the Franschhoek Kitchen will be welcomed with a complimentary glass of Colmant M�thode Cap Classique on arrival. Starters include a choice of oysters Kilpatrick, Rockefeller and naturelle, duck liver mousse on a plum confit tartlet or warm Asian salad with truffle oil. For mains, diners can enjoy succulent chateaubriand, b�arnaise sauce and chateau potatoes, tuck into Cape lobster, savoury lobster souffl� and vanilla chive sauce, or try a vegetable terrine with chateau potatoes and basil vinaigrette. A tempting chocolate three ways dessert selection, which includes a chocolate berry semifreddo kiss, espresso chocolate mousse and sea salt caramel truffle is sure to seduce even the most demanding palate. 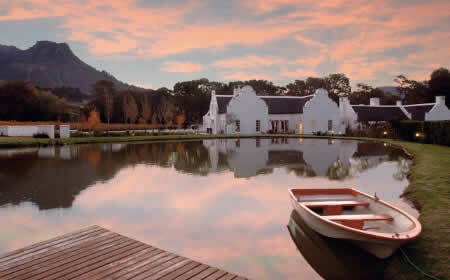 Make Franschhoek part of your Valentine�s Day and head to Holden Manz for a Winelands experience of note. The Valentine�s Day dinner on its own costs R700 per couple and the special Valentine�s Day package costs R5 000 per couple. Booking is essential on 021-8762729 (dinner only) or 021-8762738 (package).